1.75X1.75 Magnets – 5 Reasons Why You are Attempting Smart Advertising with Them? 1.75 x 1.75 magnets are smaller than many other promotional magnets, you might have come across, still they are perfect for smart advertising. Do you know why? Read this blog to understand how they can make a difference to your bottom line. Today, it is possible to find promotional magnets in any size or imaginable shape, but popularity for square magnets, rectangle magnets, circle magnets and oval magnets is extremely high. Do you know why? Because traditionalist in a customer refuses to die! There is always a dual personality conflict between a trendy customer and a traditional customer. They still believe that any information printed over customized magnets with square design stand valid because their old habits refuse to die. The battle of promotional magnets has to come to an age where every marketer wishes to make an impression over their nearest niche competitor. They are fighting it hard to buy attention of the crowd or market they are serving. This is where small square magnets can make the difference. Today, personalized magnets are the regular feature in homes around the US. People are adorning it as a reference or refrigerator art. There comes a time, when they may consider removing some advertising magnets, which is hindering their view or attention and producing some crazy collage over their refrigerator door. Here the small magnets may withstand the removal because a fridge owner may like their simplicity and size. It is a well-known fact that small sized magnets may not offer you a bigger room for constructing promotional bible, but they always allow you a big room for positioning a logo. If you go deeply, what is the most important element of a branding? A logo is the most vital element of a branding and it is the soul of the whole campaigning. A marketer who fails in presenting logo actually fails to make any impressions. 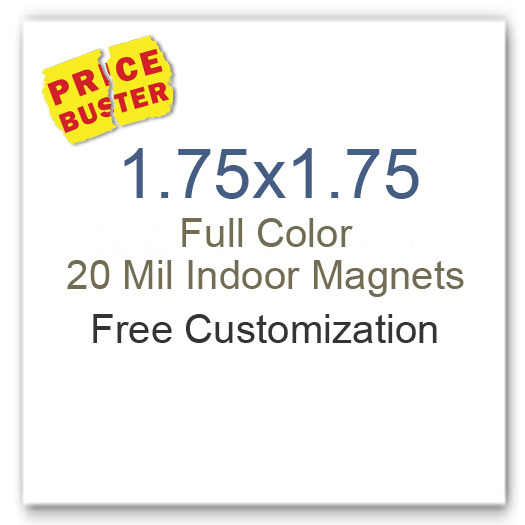 However, 1.75 x 1.75 magnets allow marketers to position their logo effortlessly. They can stay sure that their campaign is not veering to boastful talks rather remaining concentrated around a logo. As said before popularizing the business logo is the main feature of any campaign. Marketers can effortlessly do it over these customized square magnets. Additionally, they may receive benefits of free full color printing, free online design proof and free art setup by sourcing their promotional magnets from any reputed online store. As said before you will easily find square magnets 1.75 x 1.75 in various stock sizes. A streamlined view will allow you to find them in best buy pricing. Many online stores offer the best value for investment by offering large discounts on bulk ordering. By now, you might have understood, why working with 1.75 x 1.75 magnets mean smart advertising.